Saegert was an administrator, educator and researcher for 36 years at UTSA before retiring in 2012. (Jan. 31, 2019) -- Joel Saegert, professor emeritus of marketing in the UTSA College of Business, passed away last week at the age of 74. One of UTSA’s founding faculty members, Saegert was an administrator, educator and researcher for 36 years before retiring in 2012. Saegert will be remembered by his friends and colleagues for his dedication to his work at UTSA and his enthusiasm for life and international travel. Throughout his tenure at UTSA he held numerous administrative roles. From 1980 to 1985, he was assistant vice president for academic affairs. Then he served as an associate dean in the College of Business from 1987 to 1992. 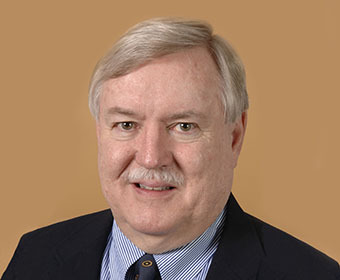 His responsibilities included overseeing the college’s microcomputer facilities, faculty issues, accreditation and graduate programs. Saegert was appointed the first chair of the Department of Marketing in 2001 and continued in that role until 2008. Saegert taught courses in consumer behavior and marketing research at both the undergraduate and graduate levels. He also served as a visiting professor at universities in China (Beijing, Shanghai and Tianjin), New Zealand and Singapore. An active researcher, he specialized in consumer psychology and market segmentation strategy. Saegert published papers in a number of marketing and psychology journals and was past president of the Society for Consumer Psychology of the American Psychological Association. He also consulted for over 50 national and regional companies including Prentice-Hall Publishers, Firestone Tire and Rubber Co., Southwestern Bell and the United States Postal Service. Prior to joining the UTSA faculty, he taught at the American University of Beirut, the University of Denver and the University of Texas at Austin. He received his Ph.D. in psychology from The University of Texas at Austin. Saegert continued his affiliation with UTSA’s Department of Marketing following retirement through his work as a trustee with the Carolan Research Institute. The institute was established to further the pursuit of behavioral science as it pertains to everyday human action and decision making. More than $250,000 has been donated to the Department of Marketing from the Carolan Research Institute to support marketing research. This support helped UTSA faculty and doctoral students publish in elite journals such as the Journal of Consumer Research and the Journal of Marketing. The gifts also led to the creation of the Carolan Research Forum in the UTSA Department of Marketing. His wife, Merry, will host a memorial service on Saturday, March 9 at 3 p.m. at their home at 257 E. Bridge Street in New Braunfels, Texas.